Six percent of canine cancer is of the oral cavity and oral tumors are the 4th most common cancer in dogs. 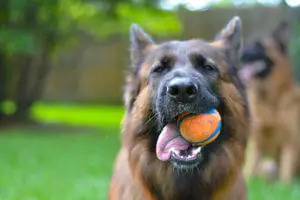 Oral tumors are more common in male dogs. Breeds with a higher risk of developing oral tumors are the cocker spaniel, German shepherd, German shorthaired pointer, Weimaraner, golden retriever, Gordon setter, miniature poodle, chow chow and boxer. Melanoma is the most common oral tumor in dogs. The average age is about 11 years. Oral melanoma is a locally infiltrative tumor (can infiltrate deep into bone) and reported to metastasize (spread) in up to 80 % of dogs. The presence of a noticeable swelling in the mouth is the most common sign. Increased salivation, facial swelling, weight loss, bad breath, pain, inability to eat, dropping food from the mouth and loose teeth are also possible. If the tumor has spread to local lymph nodes, swellings under either side of the lower jaw (submandibular lymph nodes) or in front of the shoulders (prescapular lymph nodes) may be enlarged. If the tumor has spread to the lungs, lethargy, decreased appetite and coughing may occur. Some melanomas can be diagnosed with a fine needle aspiration where a needle is inserted into the tumor and some cells are drawn from it. Fine needle aspirations of oral tumors typically require some form of anesthesia or sedation. Sometimes in order to get a definitive diagnosis, a biopsy is required where a small piece of tissue is removed and sent to the laboratory for a pathologist to look at under the microscope. Biopsies also require anesthesia. Additionally, a biopsy is required to determine important information about the tumor including confirmation of the diagnosis, as well as surgical margins and the confidence that all cells have been removed. Due to the typical high rate of spread of oral melanomas it is important to determine exactly what other organs, if any, are affected for treatment and prognostic (how well your pet will do with therapy) purposes. This is called staging. Besides an initial biopsy, common staging tests for oral melanomas include a complete blood count and chemistry profile, fine needle aspiration of enlarged local lymph nodes (inserting a needle into the lymph node and drawing some cells from it), three x-rays of the chest and sometimes an abdominal ultrasound (to look at the spleen, liver and other abdominal organs). All of these staging tests do not require any sedation or anesthesia. If your veterinarian has not removed the tumor, a CT scan (cross sectional x-ray through a particular area under general anesthesia) may be recommended for surgical and/or radiation therapy planning. This will help maximize the chance of getting a complete margin surgically or help with radiation therapy treatment planning. Treatment options for oral melanomas include surgery, radiation therapy and chemotherapy and are largely dictated by the location of the tumor within the mouth, the surgical margins after removal, whether there is the presence of spread and any other concurrent conditions your pet may have. In general, surgery and radiation therapy are recommended for local control (removal of the tumor from its current location) and chemotherapy for systemic control (controlling any cells that could have broken away from the primary tumor and are circulating in your pets body). 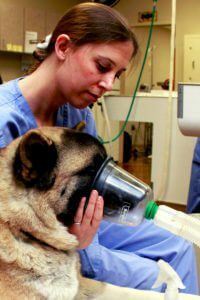 Surgery requires general anesthesia and for your pet to stay in the hospital for the day and possibly overnight, so we can control his/her pain and insure the incision is healing well. The surgeon will attempt to remove the entire tumor, along with as much of an area of normal tissue around it as possible based on the location of the tumor. Sometimes this requires removal of part of the jaw. Your dog will still be able to play with toys, eat, drink and chew bones with part of his/her jaw removed. Satisfactory cosmetic and functional outcome is in excess of 85%. Surgery maximizes the chance that all the cells will be removed and we will not have to follow-up with additional local control, such as additional surgery or radiation therapy. 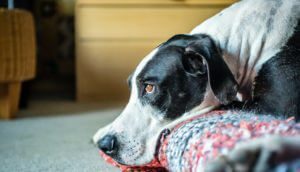 Additional local control options for an incompletely excised tumor (on the pathology report the tumor cells go right up to the cut surface and there is a chance some cells were left on your pet) include another surgery or radiation therapy. Side effects to surgical excision are extremely rare and can include opening of the wound and infection. Radiation therapy can be thought of as an intense x-ray beam that is delivered to the scar or tumor only. It can be used in two different settings; post operatively or if a tumor is too large to remove. Oral melanomas tend to be very responsive to radiation therapy whether there is just a scar or a tumor still present. The radiation therapy protocol for oral melanoma is a treatment twice weekly for seven total treatments. The mouth can be very sensitive to radiation therapy and side effects can include redness, inflammation and ulceration of the treatment site, as well as an increase in salivation that rarely affects appetite or energy level. These effects typically begin towards the end of therapy and take about one week to completely resolve. We will treat your pet with antibiotics, anti-inflammatories and pain medications if he/she is not feeling well. Chemotherapy can be used for the treatment of oral melanomas as well and is used to treat: 1) non-surgically excisable tumors, 2) tumors with the presence of metastatic disease (spread to other organs) and 3) after surgery or radiation therapy. The most commonly used chemotherapy drugs are the Merial melanoma vaccine, carboplatin and dacarbazine (DTIC). Chemotherapy is very well tolerated by dogs, especially the Merial melanoma vaccine. The most commonly reported side effects to the vaccine are local irritation at the injection site and loss of normal skin pigment (nose, skin, foot pads, etc.) More traditional chemotherapy (carboplatin and DTIC) can cause mild and self- limiting stomach upset that manifests as a decrease in appetite, vomiting and diarrhea about 3-4 days post-therapy and myelosuppression (suppression of the bone marrow and a decrease in the white blood cell level) about 7-10 days post-therapy, depending on the drug being used. Most dogs feel absolutely fine even if they have a low white blood cell level, but some can become mildly lethargic. Additionally, myelosuppression and a low white blood cell level can make your pet susceptible to an infection. Therefore, we have to monitor complete blood counts (CBC) very carefully throughout therapy. The average survival time of untreated dogs is reported to be 65 days. Average survival times and 1 year survival rates of dogs treated with surgery alone range from 5-17 months and 21-27%, respectively. In general the smaller the tumor and the closer to the front of the mouth that it is, the better the prognosis. Response to radiation therapy is excellent at 83 – 100 % with survival times ranging from 211-363 days. Traditional chemotherapy such as melphalan and carboplatin provide about a 30% response rate with a tumor present for approximately four months. The Merial melanoma vaccine is a new DNA vaccine treatment that is geared toward stimulating your dog’s immune system to fight off the melanoma. Preliminary results with dogs with advanced disease are an average survival time of 224-389 days, which significant improves to 589 days if the primary tumor is controlled with either surgery or radiation therapy.